Long obscured by her husband's shadow, Claudia "Lady Bird" Johnson emerges in this first comprehensive biography as a figure of surprising influence and the centering force for LBJ, a man who suffered from extreme mood swings and desperately needed someone to help control his darker impulses. Expertly researched and written, Lady Bird draws from rare conversations with the former First Lady and from interviews with key members of Johnson's inner circle of friends, family, and advisers. 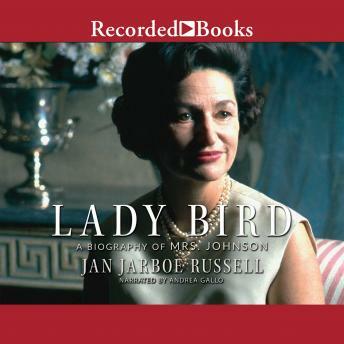 With chapters such as "Motherless Child," "A Ten-Week Affair," and "LBJ's Midlife Crisis," Lady Bird sheds new light on Mrs. Johnson's childhood, on her amazing acumen as a businesswoman, and on the central role she played in her husband's life and political career. A vital link to the Kennedys during LBJ's uneasy tenure as vice president and a voice of conscience on civil rights, Lady Bird is portrayed here as a political force, strikingly different from the somewhat minor figure depicted in previous works on LBJ. Especially fascinating today, in light of the enormous attention now focused on the private lives of our leaders, are the personal details about her marriage to a man whose extramarital affairs were widely discussed. In this intimate portrait, Russell shows us the private Lady Bird -- not only a passionate conservationist but a remarkable woman who greatly influenced her husband, his administration, and the country.